Today, Labour’s National Executive Committee will vote on whether to adopt the International Holocaust Remembrance Alliance’s (IRHA) working definition on antisemitism. I have thought very carefully about this for the past few weeks and here is where I have got to. It’s time to adopt the IHRA and move on, because this is only the first step on a long journey. I will set out my underlying assumptions first. First, I have a potential bias based on my background. I am Jewish and consider myself to be a Zionist, in that I believe the Jewish people are entitled to self determination. I also believe there should be a lasting solution to remedy the injustices faced by the Palestinian people. I have another potential bias — I have previously said that Labour should adopt the IHRA including the illustrative examples so for me to change my position now would involve accepting I was wrong the first time. I have tried to factor those biases in. Second, I am assuming the Jewish community is generally acting in good faith and without strong bias against Corbyn’s politics. I base this on a lifetime of involvement with the Jewish community and more recently in this issue, when I have had conversations with key players. Of course, some people in the Jewish community dislike Corbyn’s politics and for whom that is a big motivator. But I can assure you, from my perspective, that the motivation behind the community’s actions is real antisemitism, not smears. See my thread on existential threats. The inability to separate the Jewish community from politics — both domestic and international — and treat Jews as a minority which has historically suffered discrimination has been at the heart of this. My impression of Jeremy Corbyn isn’t that he thinks all Jews are Zionists but rather that he cannot see past the potential or actual Zionism in Jews. Third, there are certianly people in the Labour Party who want to do the right thing. There are also those who have closed their minds to Jewish concerns. Unlike with the Jewish community, I’m just not sure who from those two groups is in charge. That is important, as it causes foreseeable and unnecessary anxiety in the Jewish community. See my Haaretz article. So onto the the IHRA. I looked at the detail in a previous thread, comparing it to the NEC’s version. As I understand it, the NEC have dropped their alternative and are now proposing accepting IHRA in total, though it is rumoured there may be some “clarifications”. These “clarifications” are worrying, as the consultation process has not included consultation on any changes or additions to the IHRA definition. As I say below, I would support words emphasising the importance of free speech, but that is done without the Jewish community having seen them first, that will be very bad. You can read the full IHRA definition here. I suggest you take a moment and read it. It isn’t long and doesn’t use complex language. Since I last wrote about this I have thought long and hard about the free speech concerns expressed about the IHRA. There are real, good faith concerns about free experience and I appreciate that many Palestinian organisations have expressed these. In summary, the concern is that IHRA includes a number of illustrative examples of what “could, taking into account the overall context” be antisemitism. Some of the examples involve Israel, because sometimes antisemitism involves Israel and Jews’ relationship with the state. The examples which have caused the most concern is “Denying the Jewish people their right to self-determination, e.g., by claiming that the existence of a State of Israel is a racist endeavor” and “Drawing comparisons of contemporary Israeli policy to that of the Nazis”. The key point people are worried about is chilling free speech over Israel. My view is that the IHRA allows for adequate protection of free speech if a disciplinary process uses it as the definition of antisemitism. This is for three reasons. (a) The illustrative examples are not set in stone, by a long shot. They “could” apply “taking into account the overall context”. This is an invitation to a disciplinary tribunal to consider the full context. In fact, it’s more than that — the disciplinary tribunal must consider the full context. (b) “criticism of Israel similar to that leveled against any other country cannot be regarded as antisemitic” — this is the ‘free speech clause’ in effect, as it clearly separates free criticism of Israel from other kinds of speech. Second, the IHRA definition doesn’t exist in a vaccuum. It will have to be applied by a disciplinary panel. That panel will be aware of its responsibilities to free speech. I would be confident if I was sitting on a panel that I could draw a clear line between political speech and antisemitism. 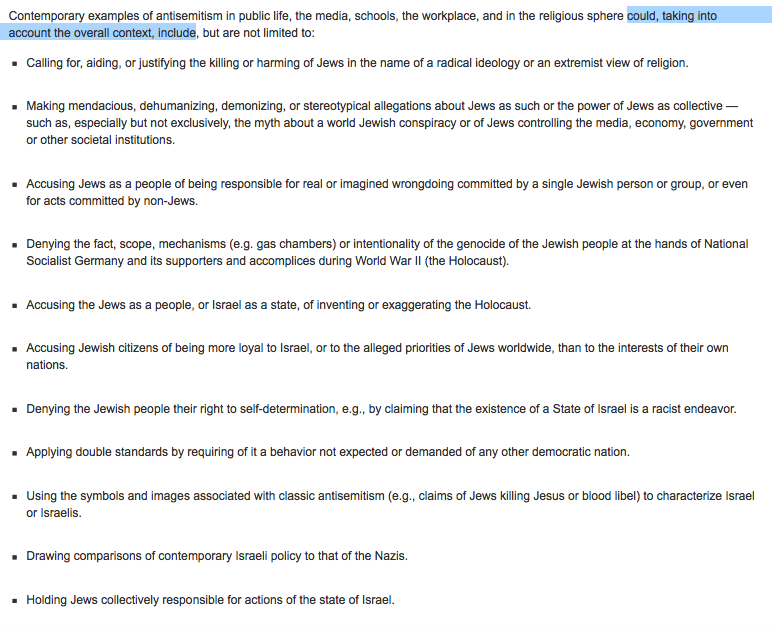 Third, people are worried about potential misuse of the definition by people attempting to quash criticism of Israel. Undoubtedly, people will attempt to misuse it by, for example, accusing people of antisemitism where there is none, or conversely wrongly excusing obvious antisemitism by saying it doesn’t fall within the IHRA definition. However, context is important again. This is a highly politically charged environment. In a complex issue such as this it is inevitable people will misunderstand or try to exploit the arena, whatever the rules. What is most important in this context is that the disciplinary panel understands the flexibility (I am sure it will — how could it not?) and that complaints are responsibly dealt with. Every disciplinary process has a responsibility to weed out, at an early stage, hopeless complaints. It happens in the GMC, in the courts — it’s not about the IHRA, its about having a robust disciplinary process. I should admit I am still worried about the free speech implications. Not because I believe IHRA is inherently flawed, but because there is so much misunderstanding over antisemitism and Israel that I believe the issues may be unsolvable whatever the definition. I would therefore support a short additional para in the Labour Rule Book emphasising the importance of free speech and political debate. I don’t think it’s needed, as the IHRA is flexible enough, but it may allay people’s fears. I would not support addition of a requirement for antisemitic “intent”. I think that would be a mistake. In discrimination law (e.g. rights at work), there is no requirement to show intent. I know Home Affairs Committee recommended it for UK govt, but it would not work here. Requiring intent would also send a signal to the Jewish community which has been clear, reasonably, that the IHRA definition must be adopted without qualification. I have said I would support a free speech addition but I don’t think that would water down the definition. That leads to a final point. Although IHRA is now totemic, adopting it is a starting point only. It’s useless if not responsibly applied. This requires a decent disciplinary process with fair and unbiased decision-makers. People must also feel comfortable bringing complaints. There is such a lot to do for Labour Party to rebuild trust. The IHRA is not a magic bullet and in fact may make little difference in practice, as the reality is that most antisemtisim should be pretty obvious to a reasonable decision maker, even in this febrile atmosphere.